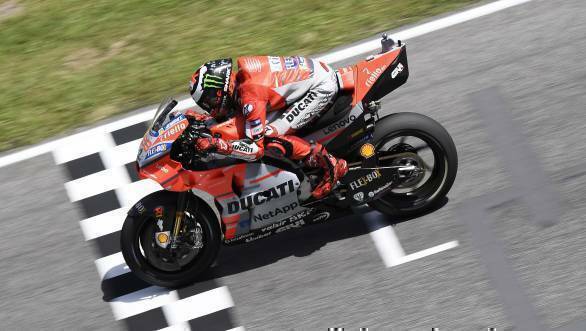 Jorge Lorenzo took a lights to flag victory at the 2018 Mugello GP in Italy, marking his first win for Ducati. Lorenzo's team-mate Andrea Dovizioso finished second, with Valentino Rossi who qualified on pole ending the race third. 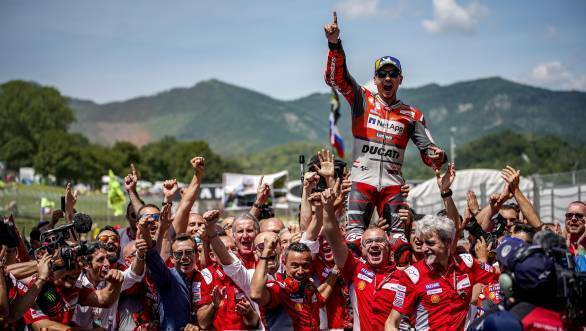 Jorge Lorenzo celebrates his first win for the Ducati team at Mugello. It was crucial for Lorenzo to prove a point to his team, given the speculation around his future just ahead of the Italian Grand Prix. Lorenzo's storming ride to victory - his first since he quit Yamaha - certainly will help build his case. When the race started, Lorenzo, who had qualified second on the grid, just behind Valentino Rossi, was able to move into the lead right away. He managed to be consistent all through the race, building of a gap to the chasing pack. He was, however, never seriously challenged for the race lead, and took an impressive win. The surprise came from Marc Marquez who, having fought his way up the order from a sixth place qualifying, ended up low-siding on the fifth lap. Meanwhile, Lorenzo's team-mate Andrea Dovizioso had moved up into second place and was pursuing the race leader. Valentino Rossi was then in third. He attempted to get past Dovi on the last lap, who seemed to lose pace in the closing stages of the race, but was unable to. Up ahead, there was no beating Lorenzo, who took first place at the event. It was his first win since Valencia in 2016. Andrea Iannone took fourth place, having harrowed Rossi a good deal over the course of the race, while Alex Rins brought the second Szuki home in fifth place. Cal Crutchlow took sixth place for LCR Honda, while Pramac's Danillo Petrucci finished seventh. Maverick Vinales finished eighth, while Alvaro Bautista finished ninth. Johann Zarco rounded off the top 10 for Tech 3 Yamaha.